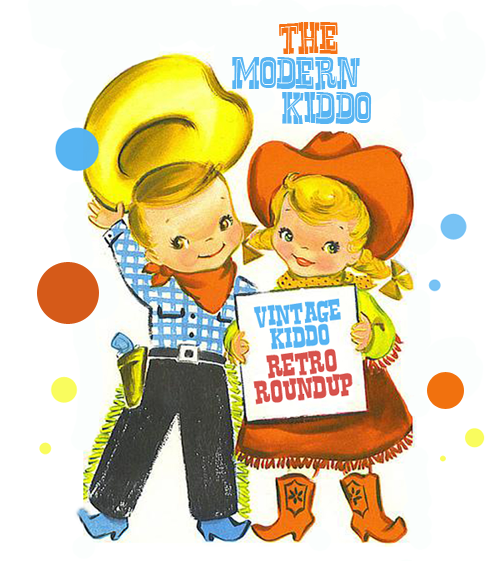 A bit of vintage kiddo goodness to start your day! Oh, what a lovely weekend we had in the Bay Area! No coats were worn this weekend. Instead it was all about bike rides and tons of snuggling and giggling with the Peach. January was an INSANE month, so it was super nice to just be at home. And of course some time had to be spent checking Esty from some sweet vintage vittles! Behold the deal of century: a lot of 31 pieces of vintage kiddo clothing for a mere $20! Etsy seller OhSydney is clearing her closets. Aw yeah! Some of the items may need a little TLC, but others are fine and dandy! In a world of pretty pink dresses sometimes, you just gotta root for the primary color dress. Like this kapow of a dress from the seventies. From Gotta Go Vintage. On the list of things I never get tired of: sweet vintage trains on kiddo clothing. Like on this little sweater shirt. Sigh. I am human, afterall… From Etsy seller, Audrey Blissful. Could we talk about this robe for a second? The amazingness of pink giraffes whose necks form long stripes? It is killing me. KILLING ME! I just went on a shopping crusade to find a nice robe for the Peach and came up with NADA. If only this would fit my growing girlie. Sob! My loss. YOUR gain! I don’t know where you find these beauties, Lishyloo! OK, COACH! Oh, this little jacket does things to me! From Etsy seller, Oliver’s Forest! This little faux deep V-neck shirt is so cute and of course made cuter by this sweet curly-haired moppet wearing it! Love! And it’s on sale. Extra love! From Etsy seller, La di Dottie! Folks, you know how I feel about gingham and ricrac. And then add in a little applique—and I’m near swooning. So you can imagine how my heart is aflutter over this adorable little dressie from Etsy seller, Bird Avenue Baby! It’s Timmy Time! And Timmy Time is super adorable! I love this rainbow clock of cuteness! From Etsy seller, Vintage Jane. Yes yes, both the puppy sweater and the giraffe robe are my faves!! So freakin’ cute. And I love going to LaDiDottie’s shop because her kids are so adorable and make all the clothes seem that much sweeter. I wish my kids would sit still long enough to model for me! Eeeee! at that tiny little dog sweater! I had two of these items in my Etsy favorites (the dog sweater and the coach jacket). Such adorable items this week! Love them! That’s nutty! Great minds think alike! the giraffe robe is in the mail, it was hard to part with that one!! please share if you do that, heather!!! I just saw this!! Thanks so much for featuring our little train sweater!